Coming on to A Time to Stand (then Project Crichton) as a Design Intern, I’ll admit, my feelings were mixed. On one hand, I was flattered and thrilled to have been asked. But on the other, terrified I’d be found out as the fraudster I was, blowing my first chance to impress, never to be asked to the design table again. With that weighing on my mind, I sat down with Tyler’s ‘expansion goals’ document open in front of me, and ran through the potential ideas that would not only meet the goal criteria, but would impress my colleagues and make interesting cards to play. Reader, feel free to insert your own mental clock-spinning/tumbleweed gif here, for I had nothing. 'How about if I were to...maybe...look at the thematic mechanics of another popular CCG...you know...just the once...for inspiration? That'd be okay, if I just did it this one time, right?' I wondered. Have them care about the DMZ. All mission-centric goals, but varied in the characteristic of the mission they focused on. After a minute or two in the binder, my gaze was drawn to Tribal Golem, and shortly afterwards, Raka Sanctuary (there is no method in my filing madness), and I couldn't help but notice their synergistic qualities; both are good if one commands/controls X or Y, but both are better if one commands/controls X AND Y. 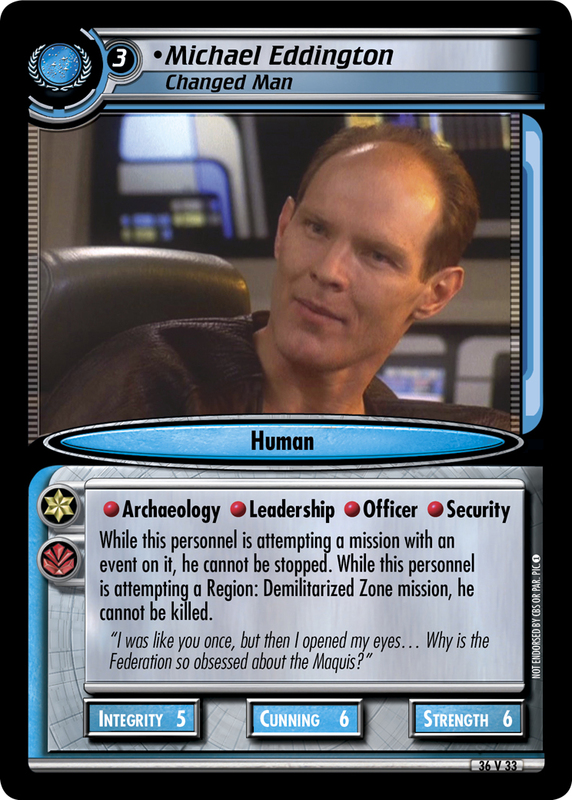 Could something like this work, but with say, Maquis personnel attempting missions? I consulted the goals. Attempting missions? Check. Events on missions? Gotcha. Caring about the DMZ? Three for three! You guys don't need me to point this out, but I will anyway – drop an event (like Self-Replicating Roadblock) on your Region: DMZ mission, and your attempting Eddington is unstoppable and unkillable! Happy with that result, and creative juices flowing, I looked at the expansion goals for Starfleet. No need for “inspiration” here. I had this. On my own. I tend to dip in and out of Magic, playing maybe once or twice a year. During my last dip in, I really enjoyed the creatures that levelled up. Could something similar be done in 2E? 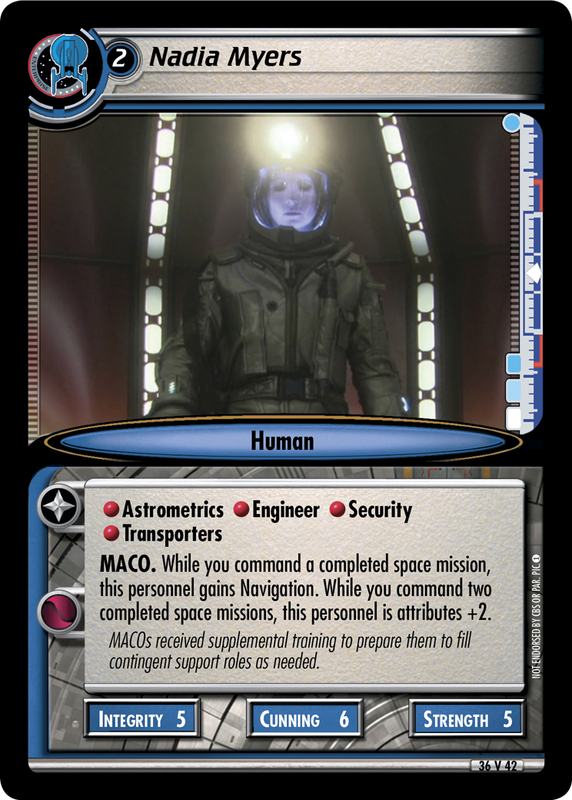 From a Trek-sense perspective it’d be good; showing personnel gaining experience and ‘rising through the ranks’, but could it work in this format? Long answer: no, because in Magic, creatures remain face-up and the use of equipment, auras, and generic ‘counters’, can easily represent a creature’s growth or ‘personal development’, while in 2E, personnel remain face down, so promoting personnel through playing cards on them or adorning them with glass beads just isn’t possible. Completing missions, that’s what. And that type of text, that can be baked right in! A quick look at the set's goals and we were good to go. A few tweaks and additions later, and here we have Nadia Myers. Here comes the obvious – get the first space mission under your belt, and she gains Navigation, which may end up helping you complete the second space mission. Get the second one done, and she goes into the third mission (probably planet) as a five-skilled 7-8-7 non-unique MACO. I was two for two! Luckily, ideas for the rest of the set, both good and bad came pretty readily, and suggestions made were entirely my own. I'd kicked the habit. No more binder-trawling for me. No, sir. On an unrelated topic, did I mention this idea I've had for a cycle of unique star-power personnel who are free to play if your opponent commands a specific HQ? Entirely my own idea. Honestly.